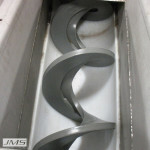 Screw conveyors are a standard means of conveyance in Water and Waste Water Treatment (W&WWT) plant applications. They are completely enclosed, have few moving parts, and have a relatively small cross-sectional area as opposed to belt conveyors which are typically open, have many rollers and a wide cross section. Screws offer an almost modular degree of flexibility in conveyor designs and are available in a wide range of sizes. To size a conveyor the target % Fill Rate must be determined. Fill rate is defined by the percent of trough cross sectional area filled (with a trough filled to the top of the screw representing 100% trough fill rate the benchmark). A best-case scenario for a screw conveyor would be a dry granular product fed at a very measurable and consistent volumetric flow rate. In that case, theoretically a short horizontal shafted or shaftless screw conveyor could be designed at 100% trough fill rate. 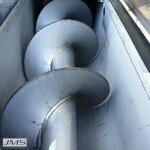 Most conveyor manufacturers however, recommend limiting trough fill rate to 45% maximum even at ideal cases (non-submerged apps) for several reasons, primarily as a safety factor for multiple design variables. In W&WWT our driest and best flowable product is dried biosolids sludge at 90%-95% dried solids (ds) and it could fall into that 45% top end fill rate, however due to high temperatures coming off a Dryer the recommended fill rate falls to the 15-30% range for shafted screws to keep hot product away from hanger bearings and shaft couplings. Shaftless screws could be a higher rate, but aren’t typically used on dry biosolids as the product temperature is typically at or over the melting point of the UHMW PE liner and using a metal liner on dry biosolids is considered a spark/explosion risk. Most W&WWT products are somewhat to very wet: Dewatered sludge 15%-30% ds; wet/dewatered grit 5%-95% ds; wet/compacted screenings 5%-40% ds. Because all these W&WWT products: are wet; considered more difficult to convey; often vary in density from day to day; and often have inconsistent flows or feed rates – they default to the conservative 15%-30% range for shafted screws and 30%-45% for shaftless screws. Let’s look at each type conveyor separately. Conveyor volumetric design rate & product density: This affects drive sizing and torque which impacts shaft diameter. Hanger bearing type: Bushing type materials vs. flexible steel roller bearing type. Hanger bearing diameter: Bearing types and shaft sizes impact bearing diameter. Shaft diameter: variables are drive torque, span between bearings, deflection. Degree of incline: Incline affects screw pitch, product fallback, screw efficiency. Hanger, shaft and flange diameters matter due to interference with product flow and increased wear on these components. An experienced Applications Engineer can assist in using variables to calculate the correct fill rate percentage. Want to learn more about Shafted Screw Conveyor vs Shaftless Screw Conveyor? Read this article to learn more the pros and cons of each. Shaftless screw conveyors do not have a center shaft or hanger bearings and thus have the ability to convey more materials. 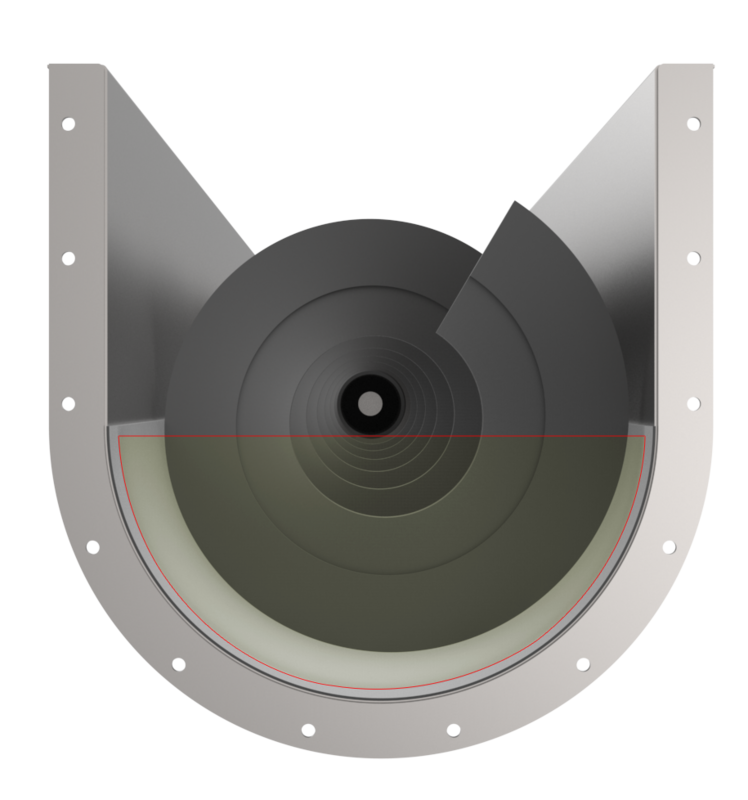 Typical fill rate for a shaftless screw conveyor is 30% to 45%. Keep in mind these percentages are for average consistent flows. On dewatered sludge apps the wettest %ds and lowest expected density should be used when calculating cubic feet/hour to get highest volumes to be conservative when sizing. 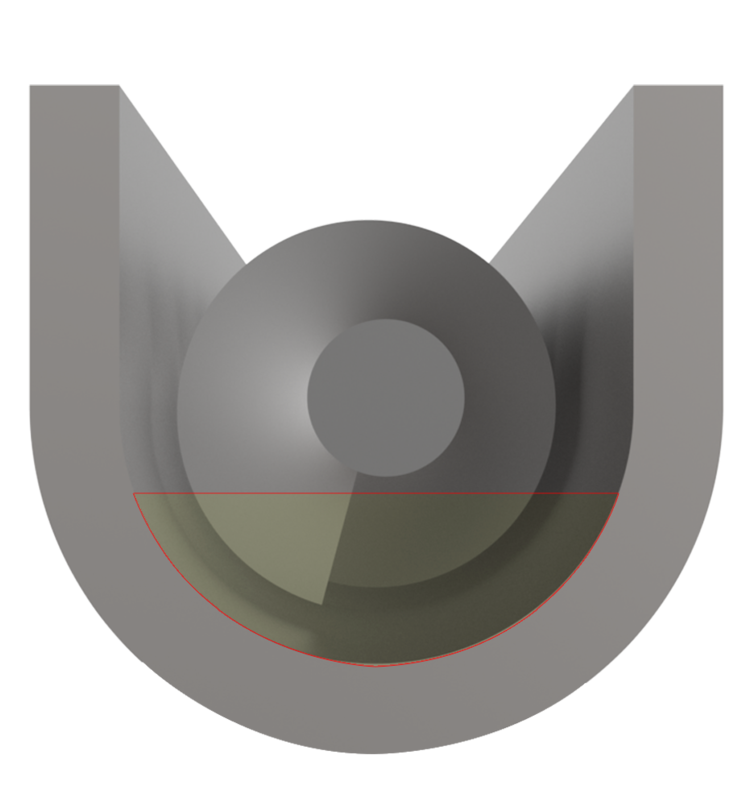 Reducing the fill rate can be utilized to be conservative when volumetric design variables are uncertain. An experienced Applications Engineer in the W&WWT Industry is aware that most influent screens and screenings compactors will deposit in batches intermittently and when given volume in average, flows can be deceiving in that instantaneous dumps can equate to many times the average flow. Screenings can also produce unexpectedly large objects. For these reasons – for a given volumetric flow rate, screenings screw diameters are typically oversized and may actually calculate out to 10% or less full rate (average/hr.). The exception to the fill rate rules above are Submerged Screws. In W&WWT underwater grit screws and Storage Hopper live bottom screws are these exceptions. In these cases, of course all are 100% trough fill rate. Certain design measures have been taken to minimalize the adverse effects of the screw in a flooded environment. We have a horizontal screw conveyor that we use to add several additives along the span of 45 feet. How can i calculate the time for a product which is added to the start of the screw to reach the end of the screw so that i can time the additional feeders to come on to feed on top of the main material? Product moves one pitch per one screw revolution. Screw pitch x screw rpm = distance per minute. Screw pitch is one complete winding of flight.